My cat HATES harnesses. How can I best get the Kitty Holster® on him? Can my cat get out of the Kitty Holster®? Most likely not, unless the harness fits your cat too loosely. It is VERY difficult for a cat to remove a well-fitting Kitty Holster. 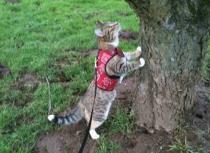 However, some cats can get out of ANY harness. In our experience, these accomplished Houdinis tend to pull backwards against a taut leash -- particularly in a tie-out situation, which we do not recommend -- while twisting rapidly with front legs straightened up toward their head, thereby being able to slip the harness over their head and front legs. 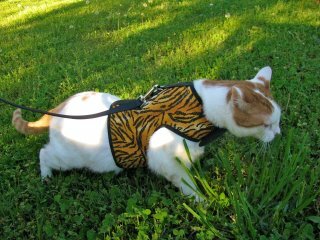 For any cat that has a tendency to pull backwards against a leash it is essential that the harness fit snuggly - think "like a glove" - NOT one-finger's width. What are the sizes that the Kitty Holster® is available in? The Kitty Holster is available in four sizes: XS, S/M, M/L and XL. Most cats wear a S/M or M/L. To be sure which size fits your cat, take a tape measure and measure your cat's torso behind the front legs. The S/M is 7 ½” long, has a 3 ½” wide girth strap and adjusts around the torso from approximately 13” to about 17" (fitting cats of about 8 - 13 pounds). The M/L is 8 ½” long, has a 4” wide girth strap and adjusts around the torso from approximately 16” to about 20” (fitting longer-backed, wider cats of about 12 to 20 pounds.) XS fits cats with a girth between 10" and 14" inches and the XL fits cats with a girth between 19" and 23" inches. How do I remove cat hair from the Velcro®? Where is the Kitty Holster made and why? Our Kitty Holsters are made in the USA. We take great pains to ensure that every product we sell helps advance a greater good. Over the years, it has become increasingly important for us to support manufacturing in the United States while providing more jobs for the American people. 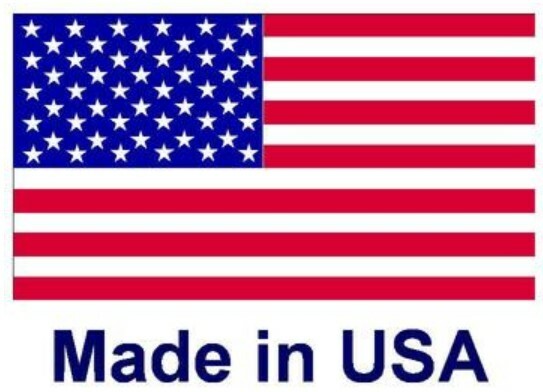 We're very excited that our products are labeled "Made in the USA" and are manufactured by a factory that provides training and economic opportunities to workers in Appalachia. What if my cat wears a collar with ID and rabies tags? Many cats typically wear a regular collar that has rabies or ID tags attached. When placing the Kitty Holster on your cat, make sure that any existing collars with tags are on top of the neck straps of the Kitty Holster. 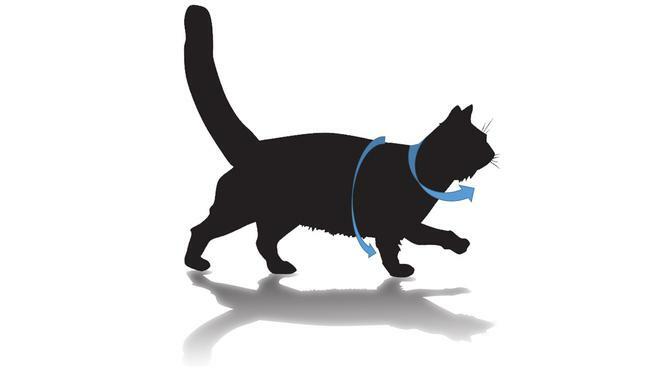 Dores the Kitty Holster® come with a leash? Matching Holster® leashes are sold separately. What is the Kitty Holster® made of? 100% cotton fabric, exclusive of decoration. The D-ring is metal and the closures are strong hook and loop. How does the Kitty Holster® stay on? 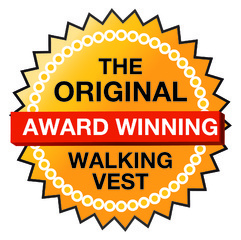 The harness secures with strong, wide hook-and-loop closures at the neck and around the abdomen. Used by Jackson Galaxy on Animal Planet's "My Cat From Hell"